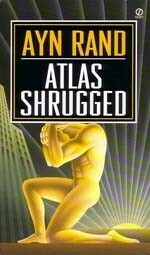 Ayn Rand’s magnum opus, ‘Atlas Shrugged’ is a book that has profoundly affected the way I look at the world. There have been very few people I have been able to share this work with, due simply to the sheer magnitude of this colossal tome. ‘Atlas’ was presented as a book selection for Liquorature after much internal debate. The guilt of foisting 1100 pages of fine print on an unsuspecting group weighed heavy. Some offline discussion between a couple of us led to the consensus that we needed something a little more challenging…a little more controversial…and a little more provocative in terms of conversation and opinion. Thus…‘Atlas’. ‘Atlas’ was apologetically presented three months prior to the actual meeting. This would be my third time through, and I knew firsthand the commitment involved in reading it. The reception to the idea was not as cold as I had anticipated. ‘Atlas’ is essentially a treatise on Ayn Rand’s philosophy, Objectivism, set in the realm of fiction. Though stylistically this is nothing new in the canon of her writing, it is definitely her most ambitious and all-encompassing attempt at presenting Objectivism and all of its utopian ideals. The story itself follows protagonists, and industrial giants par excellence, Dagny Taggart and Hank Rearden through their struggle against a collapsing society that seems to be cannibalizing itself through various social reforms. Their battle typifies the laissez-faire capitalist vs. socialist struggle in glaring black and white. Ayn Rand’s presentation leaves little room for a middle ground. The novel is timeless, in that it is seemingly set in the 1940s or 50s, yet tosses in the occasional anachronism to leave you guessing. It is a dystopian alternate reality, where most of the world’s nations have become “People’s State of…”, and heartily embraced socialism, to the detriment of the civilized world. Through the actions (and inactions) of a myriad of great producers and underhanded ‘looters’ we watch the collapse of industrial civilization. The unbelievable scope of what Rand covered herein is astounding. Nearly every possible scenario has a plausible resolution within the bounds of objectivist thought. I wouldn’t argue it would be a solution all would agree with, though I would say that it is hard to criticize Ayn Rand for holes in her philosophy. To understand the degree of animosity toward leftist thought in Ayn Rand’s work, one needs to delve into her life a little bit. Fleeing soviet Russia in her early years, she experienced first hand the oppressions rampant under such a regime. It is somewhat ironic that one of the staunchest American patriots was a Russian ex-patriot. No matter what opinion of Rand or Objectivism you take away from the book, it is hard not to admire so profound a work, and a novel of such ambition. Here’s hoping this thread sparks some of the conversation that was missed on Atlas night. Aristotle? Socialism? Atheism? Schrodinger’s damn cat? Anyone? There is so much more to discuss here. I truly hope that some of you make it through The Fountainhead at some point. It is a lot less dense than Atlas, but conveys the same ideologies. Perhaps one of the greatest books written in our time. WHO IS JOHN GALT? There is word that the long awaited movie version will be out sometime soon, and woudl worry that, like most movies based on books, would destroy the ture message. Only time will tell…..
Have you tackled “The Fountainhead”? Hey, Lance…can we expect Medina’s thoughts posted here at some point?